Hein Rühmann's parents ran the restaurant at the station in Essen and as a child he frequently entertained the guests there, reciting poems. His parents next started a hotel but they went bankrupt and divorced in 1915. His father died in Berlin shortly afterwards and possibly committed suicide. In 1916 the family moved to Munich where he went to school but what he really wanted to be was an actor. He took acting lessons with Friedrich Basil and soon an engagement in Breslau followed. But he was little succesful there because he was too small to play heroes. He moved on to the Residenztheater in Hannover, but that theater closed. Rühmann continued his career in Bremen, where he had his first succes in "Der Mustergatte". But he left Bremen and returned to Bavaria, where he worked for the Bayerische Landesbühne for a short time. There he met Maria bernheim, an actress who used the name Maria Herbot. His next engagement was at the Münchner Kammerspiele where Hermine Körner saw a future for him in comical parts. He married Maria in 1924 and he played the main part in "Die Erwachsenen" shortly afterwards. In the late 1920s he had his first movie parts i nsilent movies. His part in "Die drei von der Tankstelle" (1930) made him well known in Germany. More movies followed and he also made records. He was soon able to fulfill his old dream to buy his own plane and he befriended the famous pilot Ernst Udet. After the nazis came to power he was silent about politics but he was on good terms with Goebbels. But Maria was partly Jewish and this meanttrouble. He appealed to Goebbels and then to Göring. The latter advised him to divorce Maria and let her marry a foreigner. Their marriage was already damaged at that time and Rühmann had conducted a long affair with the actress Leny Mahrenbach during the mid 1930s. He divorced Maria and she married the Swedish actor Rolf von Nauckhoff who lived in Germany. They moved to Sweden in 1943 where Rühmann supported them financially. After his divorce Rühmann was able to work again. In 1940 he directed an UFA movie for Goebbels' birthday. He met the Viennese actress Hertha Feiler during the shooting "Lauter Lügen" and they were married in 1939. In 1942 their son Peter was born. The public hardly associated him with the nazi regime allthough he was on the list of actors that were excused from serving in the army. Although he had bought a villa in Berlin from Jewish owners against very favourable conditions, he was allowed to continue his career after the war. After a difficult phase he made a come back with the help of Helmut Käutner, who directed "Der Hauptmann von Köpenick" (1956). He made many more succesfull movies during the following years. From 1960 to 1962 he also performed at the Burtheater in Vienna. In 1970 Hertha Feiler died of cancer. He married his third and last wife Hertha Droemer in 1974 on Sylt. In 1982 his autobiography "Das war's" was published. During his last years he held readings and made more records. On 15 Jan 1994 he was on television for the last time and he died in October of that year. he was buried in Berg-Aufkirchen, close to the villa where he had lived with Hertha. 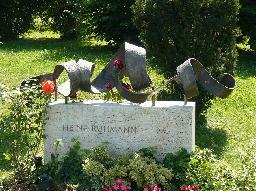 The grave of Heinz Rühmann in Berg-Aufkirchen.